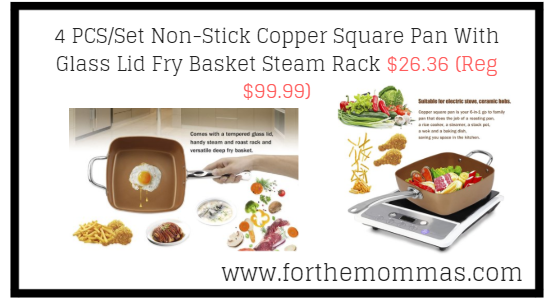 Walmart has 4 PCS/Set Non-Stick Copper Square Pan With Glass Lid Fry Basket Steam Rack for $26.36 (Reg $99.99). Choose in store pick up to save on shipping charges. This Copper square pan is your 6-in-1 go to family pan that does the job of a roasting pan, a rice cooker, a steamer, a stock pot, a wok and a baking dish, saving you space in the kitchen. Large deep sided square shaped design enables you to fit more food into the pan than a traditional round pan. Non-stick ceramic , easy to clean.